Gen Xtinct: Classic Clip Monday: "The Boys in Company C"
I heard Bruno Mars’ latest song, “Grenade” (“I’d catch a grenade for ya, throw my hand on a blade for ya”) for the first time the other day, and it made me instantly and out-of-nowhere flash to “The Boys in Company C,” and its heart-wrenching, what-just-happened? grenade scene near the end of the movie. I won’t spoil it, but I’ll just say it’ll stay with you. It’s stuck with me for more than 20 years. It feels a little like a made-for-TV movie (except for all the swearing. NSFW alert on the clip below, by the way), but if you’re a fan of “Full Metal Jacket,” you’ve got to check it out. The movie, about a group of soldiers-turned-soccer-team in Vietnam pre-dated “Jacket” by 10 years, and starred Andrew Stevens, Craig Wasson and Michael Lembeck (from “One Day at a Time” and “Kaptain Kool and the Kongs”). 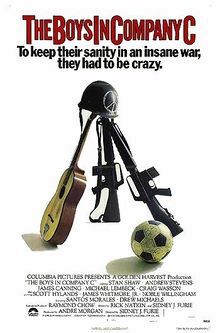 It even featured R. Lee Ermey -- who can currently be seen in a memorable GEICO commercial (“You Jackwagon!”) – in his first role, playing almost the exact same character he played to such great acclaim in Kubrick’s classic film.